A recent paper from LPL Research Private Client Thought Leadership (this link opens a PDF) makes a valid point: While the investment industry tends to communicate in style boxes, what investors react to is stories—or themes, to use LPL’s word (and in a foreshadowing of its thematic portfolios to come). There may be no better storytelling format than video. In fact, recently surveyed marketers said video is the most effective social content. And yet asset manager use of video has struggled to fire on all cylinders. The Compliance requirement to script on-camera talent, the often stilted deliveries and the very messages themselves have fallen flat. Some firms have hesitated to use YouTube to expose their videos to the broadest audience possible. Many firms that publish on YouTube have neglected to throw any search engine optimization support behind them. Video views of fund company videos hang in double-digit land even as survey after survey ranks video high on the list of advisor and investor social influences. Whose videos are making an impression? Videos produced by other than asset managers, that's been my nagging suspicion. Almost every leading firm—American Funds, DFA, Davis Funds, you name it—showcases at least one video on its home page. Strategists, portfolio managers and others are taking chill pills. Almost gone are the deer-in-headlights teleprompter-scanning deliveries of yore that made many videos uncomfortable to watch. Talking heads are displaying a new energy, thanks in part to not being tethered to a script. For one of my favorites among the new breed of videos: check out (click here to get to the Brightcove video) how MFS Chief Investment Strategist James Swanson renders both the question-asker and question title slide obsolete. He stares directly into the camera, asks himself a question and then answers it. Most important and back to the point of this post, there's an evolution toward product “stories,” consistent with what LPL is calling for and more aligned with what people will care about. It's possible that a video featuring a portfolio manager expanding on a fund’s investment objective or process might attract a narrow audience. Loyalists might watch all of a strategist’s sweeping account of the past or coming quarter. But the improved product-related videos serve up specific, often illustrated answers to questions that a YouTube searcher may very well be asking. If the story leads with the why as opposed to the who and the how, a product-centric video can be engaging, as shown in this U.S. Funds’ video on JETs. Here’s WisdomTree effectively delivering a presentation about the opportunity in emerging markets. IndexIQ takes on the topic of currency hedging in three short videos that intersperse currency-related questions to keep viewers engaged. See the questions starting at 1:44 in this part 2 video. ETFs, especially those in niches, have a storytelling advantage, to be sure. But this Royce Premier Fund video acknowledges that advisors/investors also want to hear more about what’s in their mutual fund—and maybe especially changes to the portfolio’s composition. Starting at 0:46 (click on the image to go to the site), listen to the portfolio managers describe a few companies recently added to the Royce Premier Fund and why. None of this used to happen—let alone made available for the public via video. Video truly offers the capability to better inform advisors and investors, as these firms are demonstrating. The content has real value. The next hurdle to clear is to assure that these good stories find their audience. So much of this business happens virtually—marketers, especially, spend little time in the physical presence of their financial advisor clients or their competitors. To me, the novelty of everyone coming together under one big tent is at the core of the appeal of the Morningstar Investment Conference and what drives so much of the energy of the sessions and the Exhibit Hall. The conference is where industry participants come out from behind their desks and mingle, and where luminaries such as Mario Gabelli navigate the Exhibit Hall within easy reach of mere mortals. The 2015 affair, held Wednesday through Friday last week, didn’t produce the OMG factor of Bill Gross in sunglasses, as happened last June and reverberated the rest of 2014. Regardless, Morningstar produced another successful and engaging event. I attended as a guest of Morningstar's Leslie Marshall, Director–Events, Magazine and Social Media, and my thanks to her and her team. As I’ve done the last few years (see the 2014 and 2013 posts), I made a couple of random notes to mention to you. While others have reported on the substance of what was said at the event, the focus of these comments is on how content and marketing messages were shared. Pioneering work from previous years—whether in social, the mobile app, Exhibit Hall creativity—was improved upon in 2015. By and large, the change I spotted this year was incremental forward motion. An event is about the exchange of ideas, and that’s something that happens from the presentation dais, in the Exhibit Hall and in one-on-one conversations. Social media amplifies it all. Let’s begin with Leslie’s report on the 4,600 #MICUS tweets and 31 million timeline deliveries by what I'd guess is the largest number of engaged Twitter accounts to date. Asset managers continue to sharpen their use of the #MICUS hashtag. The following tweets showed that Wells Fargo and MFS were paying attention to the general sessions while simultaneously pursuing their goals to drive booth traffic. Well played. Twitter is the back channel but this year for the first time, Morningstar displayed tweets on the big screen in between general sessions. Even more reason to give your conference tweets some oomph. The #MICUS focus centers on Twitter, which makes sense because that’s where most of the conversation takes place. But a few asset managers also brought Morningstar into their LinkedIn posts. In addition to live tweeting from its @Vanguard_FA account, Vanguard created a LinkedIn update about what others tweeted from a product manager's Morningstar appearance. One almost never sees this: A Calamos LinkedIn update quoted the comments of another asset manager, PIMCO, on active management while linking to a Calamos piece. It’s official—the head nod is being replaced by a session attendee lifting up a smartphone to snap a picture of a slide. Is there a better compliment for a presenter? But maybe this too will go by the wayside. Although not explicitly promoted this year, Morningstar is starting to use its browser-based app more as a go-to place for content—slides, whitepapers, links, etc., according to Leslie. She calls the app a "resource repository for attendees." Attendees don't need to strain to take a photo of a slide if their event app contains a link to the entire presentation. And, tweeters can just take a screenshot of what's on their phones. More to the point for mutual fund and exchange-traded fund (ETF) marketers, this is another means of distributing your content. As you can see in the screenshot below, the Morningstar app event listing for the general session featuring J.P. Morgan’s David Kelly also included a link to the slides to the J.P. Morgan deck. But this year a link to an asset manager document was uncommon. Typically, the event listings linked to a Morningstar deck associated with the breakout sessions (featuring representatives from multiple firms). A PIMCO general session listing linked to Morningstar’s June 2015 analysis of PIMCO. A few years ago, the Social Media Center was an oasis occupying an impressive amount of real estate in the otherwise bustling Exhibit Hall. I used to enjoy shooting the breeze with Blane Warrene and crew, only occasionally interrupted by financial advisor attendees. Most seemed to speed up as they passed. But, props to Morningstar for sticking with it because last week the social media center was hopping. No more playing around with social media—it seems the surveys are getting it right, advisors are engaging. I looked forward to the conference as an opportunity to experiment with Periscope, an app released this year that enables a user to livestream or “broadcast” to Twitter. Where better to use Periscope than to livestream what's happening at an event? That’s what I thought prior to the start of the conference and that’s what I continue to think, despite a fairly rough go of testing it myself. My experience illustrates the hazards of working with new platforms. I was using Periscope for Android, which was released in late May. Things can go wrong or at least not as expected, and that can be discomforting in a professional setting when the value of the communication is that it’s live. Luckily, this was all for my own experimentation and no animals or clients were harmed. Assuming all the correct settings are turned on, account followers are notified when a broadcast is live. They can interact with the broadcaster to comment, ask questions or send a little love in the form of a stream of hearts. This is so new, I wasn’t expecting a gang to pile in, but I was hoping there’d be some interest. Prior to Thursday, I’d tested everything I could—streaming and talking and walking. Also, I came packing a sophisticated livestreaming camera aid that you may also recognize as a selfie stick (but aimed outward). The value of Periscope is the livestream. But I wanted to save what I’d created so I’d tested the autosave to Camera Roll feature, too. The sound levels, available bandwidth and overall energy of the Exhibit Hall that morning all were things that couldn’t have been tested ahead of time. As one of my first “scopes,” I created a 16-minute video during which I walked the hall, taking time to show each booth. In my wildest dreams, I was providing a service for the stay-at-home marketer who might want to check out his or her own firm’s booth or get a feel for the Hall layout in general—in real-time! In fact, this happened—Natixis’ John Refford spotted me Periscoping, sent a request via the chat note within the app to see a livestream of the Natixis booth and the team. So, I created a special livestream just for him. It worked, sweet. I wish I could show you both of those videos but for some reason I can’t. The videos were saved, I can watch them as a replay within Periscope and on my phone. But despite repeated efforts to download them in a variety of ways, these videos won’t budge. There's barely an online user community to reach out to, and I’m still waiting to hear from Periscope’s support. Two videos are able to be accessed, and their quality will likely reassure you that you’re not missing much not seeing the other two videos. There’s a lot of pixelation, the audio and video are out of sync at times, the lighting and the volume are not great. If all I wanted was to create a video to show later, my camera on my phone would have done a much better job. Periscope offers the promise of both showing a stream live (and I had higher quality expectations) and saving that stream to use later. Having hopefully managed your expectations, the following are two livestreams (since saved and lightly edited as videos) that I created. My hope was that they might draw a live question or two from Twitter at large but none materialized. Even so, I'd underestimated the distraction of watching the phone for viewers to join or chat while filming an interview at the same time. The first video shows MainStay’s virtual greeter, which was easily the most innovative booth traffic-driver (my tweet referred to it as booth bait) at the conference this year. MainStay is 2 for 2 for producing the Exhibit Hall's top head-turner, following an equally innovative campaign last year. MainStay’s Director of Social Media Frank Ranu explains how the lifelike motion-sensitive greeter uses a few opening lines to draw attendees in to watch brief video clips. T. Rowe Price was one of a few firms that seem to have devoted their booth space to their apps (J.P. Morgan Funds being another). I wandered into the booth and found myself talking to Darrell M. Riley, Asset Allocation Group. We’d planned on doing a demo, but the demonstration iPad happened to be low on battery at that very moment (the heartbreak of live). Darrell smoothly segued into an explanation of the MarketScene app strategy. Later, I just had to chuckle about what I put these two gentlemen through. The Exhibit Hall was dotted with professional lighting and video setups, and it was their luck to be visited by a woman waving a dinky phone on a stick, asking them to talk to it. Oh and to remember, “Everything is going out live to Twitter!” They were sports. I encourage you and your teams to research Periscope—and vertical video in general—yourselves. There are lots of possible applications for a livestream and it could be awesome. As with all other platforms you don’t control, just remember to limit your dependency/exposure and have a Plan B communication method ready. Were you at the conference this year? Please use the space below to tell me what I missed. 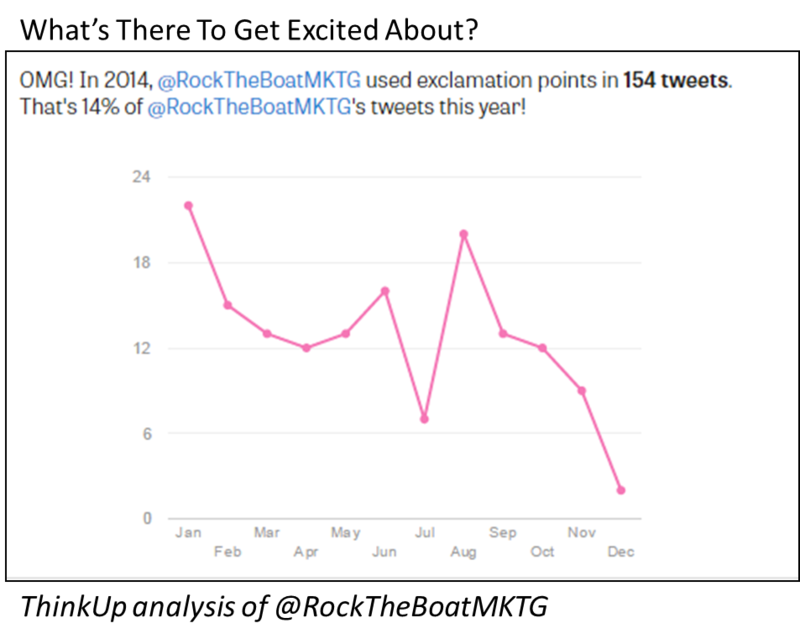 Pay no attention to the graph below that suggests my excitement on Twitter plummeted from its high at the start of 2014. I begin the Rock The Boat Marketing annual round-up of favorite content super-optimistic (is that better?) about the quality and range of content that I stumbled upon this year. So much so that I can finally limit this list to content highlights produced by and about the asset management industry alone. That’s a change from previous years’ lists (2013, 2012, 2011, 2010), which included a handful of investment industry examples along with mainstream content gems. This year someone else can cover the Adele Dazeem Name Generator aka Travoltifier. Unchanged is the need to acknowledge straight away that there’s no identifiable criteria being applied here. My favorite content, numbered below and yet in no particular order, made an impression that continues as much as 12 months after I first saw it. Whether it broke new ground, introduced new ideas, deepened my understanding or changed my mind, I found myself returning to this content, emailing links to it and finding a way to work it into presentations. Not so long ago, tampering with an investment company logo might well have been a fast way to meet the brand’s legal representation. The brand would never have publicly acknowledged yet alone embraced whatever travesty might have occurred. When, in February 2014, Jimmy Kimmel Live created a Kidelity Investments, Fidelity jumped on board. On Facebook and on Twitter, it shared the video and then deftly sought to use the mention to its advantage. Well played, Fidelity. First the video and then the tweet. The rise of the “robo advisor” dominated financial advisor news this year, sharpening the advisory community’s focus on the value it provides. Vanguard stepped up to help quantify the value in what has to be among the most valuable insight advisors were offered by asset managers in 2014. Putting a value on your value: Quantifying Vanguard Advisor's Alpha was published in March (the table below is an excerpt from it). 3. And Where Did The Money Go? This infographic is genius and yet why didn't anyone think of this before? We've all seen, produced and updated the classic Asset Classes Returns matrix chart (at right is J.P. Morgan's). In February, Kurtosys presented 10 years of fund flows into various asset classes. Shown below is just an excerpt. Just before the mainstream adoption of social media, the event experience was getting a tad predictable, wasn’t it? Presentations prepared weeks ahead were delivered by expertly polished speakers, most of whom seemed oblivious to the audience. They were on, they were off and then they were on their way to the next gig. Social media gives conference attendees a voice, thereby introducing an accountability edge to the experience. Plus, event content-sharing includes the stay-at-homes who can easily follow along. The Morningstar conference machine was humming along that day in June when PIMCO’s bond king Bill Gross took the stage wearing sunglasses and delivered some far-reaching (from The Manchurian Candidate to Kim Kardashian) remarks. Before social media, reporters would have reported on Gross’ comments, of course. But I believe the sustained social attention—including the industry’s very own meme created by Michael Kitces—ramped everything up. It seemed to set in motion the events that culminated in Gross leaving PIMCO for Janus, a September episode that was riveting to watch and, for some of your firms, benefit from. This was the year that asset managers joined other brands in wading into what’s called native advertising—content sponsored by an advertiser that looks as if it could be editorial. One of the best examples has to be Goldman Sachs Interactive Guide to Capital Markets. The guide debuted on the New York Times site in February and now also lives on Goldman’s. The top metric on this, according to what Amanda Rubin, global head of brand and content strategy at Goldman Sachs, told Contently, is time spent. Easier said than done, especially if you’re a quanty portfolio manager, or at least that’s been my observation. That’s why this Van Eck portfolio manager selfie from October tickled me. Ellen De Generes and her Academy Award cronies are actors. Mugging for cameras is what they do, we shouldn’t be surprised. But when money managers think to use (or even if they were cajoled) a relatively new platform to be social and show a little personality, that’s cool. Nobody retweeted this, though, it’s often pointed out to me. While that’s true and I wish someone had if only to encourage Van Eck, it’s not always about the retweet. Imagine seeing this tweet in your stream—four guys squeezing into the frame while taking care not to obscure the bridge behind them. This is cute. My bet is that it prompted a smile from those who did see its one and only appearance, making the kind of incremental positive impression that can be achieved on Twitter. Sometimes you just deliver a message, you don't always get a receipt. 7. How Soon Before We’re Really All Working For Google? While Brooke’s focus was on the uninformed purchase of online advertising, it applies, too, to what may be the most intriguing story of the year: the Financial Times’ September report that Google two years ago hired a financial services research firm to assess how to enter asset management. When something critical is written about an asset manager, the standard response is to turn the other cheek, to not engage. But there may be times to do the opposite, given the long life of discoverable Web pages. This year saw a few firms standing up for themselves in public ways. In September, AdvisorShares distributed a press release about a five-star rating on one of its ETFs. In response, ETF.com writer Dave Nadig cautioned readers not to be "starstruck" about that fund. And, AdvisorShares CEO Noah Hamman took to his AlphaBaskets blog to respond to Nadig point by point. Wow. No mutual fund company takes on Morningstar just because. But Royce Funds’ apparent frustration (“while both our investment philosophy and process, which date back to 1972, have remained steady over the years, most of our funds have experienced frequent movement in and out of Morningstar's equity style categories”) prompted the firm to research how common it is for funds to move between categories. A subsequent video (not embeddable—click on the image to go view it) presented an interview with Director of Risk Management Gunjan Banati sits down with Co-Chief Investment Officer Francis Gannon. We don’t ordinarily think of advertising as content, but the John Hancock Life Comes Next series of intriguing television commercials are cross-channel. They serve as teases that lead to the microsite where three endings are offered for each, backed by related content. Veteran advertisers like John Hancock know how to create commercials that are evocative, and these are terrific. If the overall program is succeeding in engaging viewers in the follow-up content and #lifecomesnext Twitter conversation, they’ve crossed a frontier not many have. Who says you can’t mention product in your blog posts? Lots of people have, over time. The idea is to engage with content that's a level above product. But this isn’t a hard and fast rule for a business whose business is to manufacture products. Technology companies, for example, blog about their product innovations and updates. There’s nothing poetic about this January Direxion Investments post but it’s straightforward in connecting forecasted trends with ways to use ETFs to play them. Why not try sales ideas as blog posts and see what happens? Most obvious: The list itself, published in March, is a good place to start if you’re wondering who to follow on Twitter. Finserv isn’t as showy and prolific as others, and you could burn up a lot of time before finding these accounts on your own. The very ability to create a list of 250 names of individuals focused on the regulated financial services industry (broader than just asset management) flies in the face of those who believe not much is happening with financial services and social media. There is a community, in fact. Lots of smart people have seized on social media for its potential to improve information exchange and overall communication, and the focused content sharing by these Twitter accounts helps foster that. Jay gives a good tutorial on how you might use Little Bird to create your own list of influencers for use in market intelligence. The exercise can help you see the value of optimizing your firm's social accounts with relevant keywords and hashtags that will help others find you. One of 2013’s content highlights was TD Ameritrade’s creation of the Investor Movement Index, based on a sample of the firm’s 6 million accounts. It “raised the bar for other investment companies whose proprietary data contains insights when aggregated,” I wrote. It’s back in the list this year because of a Tumblr post by Nicole Sherrod, Managing Director of Trading at TD Ameritrade, published on Yahoo! Finance. Sherrod used the actual data to challenge sentiment survey results. You have to love this subhead: "Is Investor Sentiment Like the Truthiness of a Tinder Profile?" What people tell the American Association of Individual Investors (AAII) Investor Sentiment Survey that they’re doing is one thing, Sherrod writes, and is volatile. At this point, financial advisors’ use of social media has been a preoccupation for several years. Early on, it was enough to know that some percentage of advisors considered social media appropriate for business. But as interest heightens among asset managers, broker-dealers and vendors, questions about advisor participation have necessarily gotten more granular. We are well past high level issues. Given the investment that’s being made in content development, training (firm/advisor) and increasingly advertising, we need to know who’s doing what where and why. Last week Putnam shared the first of the results of an extensive survey that reports on some issues not previously researched and digs into questions just superficially covered previously. These details could provide the insight needed to optimize your strategy. There is a lot here worth your attention, given the survey’s finding that more than half (56%) of advisors now say that social media plays a “somewhat significant to very significant” role versus 35% just one year ago. When you’ve got it, flaunt it. This iShares video plays to the performance chops of fixed income strategist Matt Tucker and troupe. BONDing is a 2014 asset manager video series (just two to date) that investors will both learn something from and enjoy. My favorite moment in the video below comes at 1:40. Watch for the hand, that's just people having fun. Mutual fund and ETF videos could use more of that. Inspired after reviewing the 2014 content that has stood the test of time? Download Synthesis Technology's Win The Investment Marketing Game, a 20-page e-book that I was pleased to participate in. This will be the final post of 2014. My sincere thanks to all who contributed to and followed the blog this year. I wish the happiest of holidays to you and yours. Meet you back here the first week of January 2015. What’s It Like To Work At….? Bill Gross can’t be the only asset management firm employee who’s wondered whether the grass is greener somewhere else. Fortunately for job-seekers inside and outside the investment industry, “careers” videos are becoming prevalent both on LinkedIn Career pages (a paid service) and domains. Of all the storytelling that’s being attempted by digital marketers nowadays, the careers videos are among the best work. It helps to be working with people and emotions. Which is not to say that these are easy to produce. There are too many stakeholders and too many balancing issues (which locations, which businesses represented, how much diversity is enough) to expect to get these done in short order. Once created, however, they seem to have a fairly long shelf life. Do you work for a smaller firm? Don’t take a pass just because you don’t do a lot of hiring. These videos are as much about conveying the culture of a firm (important to clients and prospects, too) as they are about appealing to job-seekers. And, as we’ve seen with lots of other online videos, low budget and informal videos can be powerful and effective. Maybe you already have some video that can be repurposed. Sunshine, lollipops and rainbows everywhere? Even if the videos do present an idealized view of a workplace, I’m a sucker for these. “We like people who are going to step back and question how things are done,” says Forward CEO Alan Reid. Enough said, although this 2:45 video elaborates. Fidelity is a bigger employer than most, which explains why it has a Jobs subdomain and a media library of no fewer than eight videos. My favorite features long-term, blissfully happy employees at a 2013 Employee Service Recognition ceremony. I love everything about this, including the snazzy jazzy music. Smile and dial, that’s the motto of the “people” people who are on the phones at Putnam. Did somebody say “integrity”? Yes, they did, over and over again in this Franklin Templeton video. On its site, AQR features videos highlighting three employees. This "Why AQR?" video shows a vice president on the global alternative multi-strategy team discussing the stimulating environment, including working side by side with her Wharton undergrad accounting teacher. The videos aren't able to be embedded, just click on the image to go to the video-serving page. The assumption of this Morningstar video is that job-seekers are hoping to find a “cool” employer—so Morningstar delivers, along with bagels apparently. Robert W. Baird makes quite a few culture and employee benefits points in this 2011 profile focused on a single investment banking associate. It’s one of 12 video stories in the Careers section of the Baird site.